South Korean President Moon Jae-in’s approach toward energy production is raising hopes for the end of coal and nuclear power plants in the country. The liberal leader -- an advocate of nuclear-zero Korea -- and his administration have unveiled a roadmap to reduce reliance on nuclear and coal energy, citing public concerns over air pollution and nuclear safety. At present, 25 reactors are in service and the Moon administration aims to begin by shutting down aged facilities and eventually phasing out the rest over the next 40 years. Moon’s strategy includes moving toward green sources playing a bigger role in energy production for South Korea. He aims for liquefied natural gas to meet 37 percent of the country’s energy needs by 2030, while raising the proportion of energy produced from renewable sources to around 20 percent. Nuclear power plants are responsible for about one-third of the country’s power supply, as nuclear energy was preferred to traditional sources like coal power over the past decades, due to lower greenhouse gas emissions. “No single country on Earth would use nuclear energy because they like it,” said Lee Kwan-seob, chief of Korea Hydro and Nuclear Power Co., in a recent interview with a local newspaper. “Korea has no option but to use it simply because it is the cheapest source,” Lee said. The KHNP’s building of two more nuclear reactors, Shin Kori No. 5 and No. 6, slated for 2022 completion may come to a halt, following President Moon’s promise to review the move, as part of his plans to put an end to the nuclear energy industry here. The KHNP has already put in 1.5 trillion won ($1.3 billion) and completed 28 percent of the construction. Experts, however, voice concern over the country’s energy needs. “Whether or not Moon actually halts construction on coal and nuclear plants will depend on whether or not South Korea can meet its energy needs without them,” said Choi Ki-ryun a professor of energy engineering from Ajou University. “The government’s one-dimensional approach to simply close down nuclear reactors is overlooking the crucial need for financial assistance for electricity production,” he said. Instead, Korea should keep a “minimum number of nuclear reactors,” he added. A minimum number of nuclear reactors must be operated to support energy needs and meet projected electricity demand, as well as to maintain “energy security,” according to the professor. Industry insiders also echoed his view. “Thanks to nuclear reactors built and operated since 1978, Korea could keep electricity at low prices and become a country with a developed economy,” said Noh Dong-seok, a researcher at the Korea Energy Economic Institute during a symposium held Thursday to celebrate the operation completion of Kori No. 1. “The government’s pledges are not feasible because such a transition will be unable to meet projected electricity demand at a reasonable price,” he said. According to data from the KEEI, if the government replaces all 25 nuclear reactors with renewable energy generators, the public will pay prices that are at least 79 percent higher than current electricity prices. Korea does not have enough technological knowledge to increase its energy reliance on renewable sources, other experts said. “The supply of renewable energy remains precarious, because humans cannot control such sources,” said Kim Seung-rae, a professor of economics from Hallym University. “Nuclear-zero or coal-zero policies have a very low feasibility,” he argued, adding that Korea needs more research and development in energy storage systems in order to increase its proportion of green energy reliance. According to scholars, a nuclear power plant with a capacity of 1,400 kilowatts is equivalent to a total of 1,700 wind power generators that each generate 3 megawatts. They highlight Korea’s lack of large sites to build winder generators, each the size of a 33-storey apartment building, making it difficult to build more. Last summer, the Energy Ministry disapproved of North Jeolla Province’s plan to create a wind power generator cluster, due to strong opposition from nearby residents and civic groups for similar reasons. The efficiency of solar power generators is also in question, considering the massive amount of fine dust it creates and short inverter span. Experts say that such conditions would push up electricity prices. The Korea Power Exchange currently controls the price of electricity generated from nuclear reactors at 62.69 won (6 cents) per kilowatt per hour, far cheaper than those produced by coal-power plants (70.99 won), liquefied natural gas (150.29 won) and renewable energy (210.77 won). “Experts view that renewable sources generating 10 percent of total electricity production by 2030 is a ‘dream,’ as the current administration is overlooking plans to transport and store the renewable energy sources,” said Seo Kyun-reol, a professor of nuclear engineering at Seoul National University, during a debate in April. Meanwhile, environmental activists still hope to see a paradigm shift in the energy industry here. “Putting a halt to the construction of new nuclear reactors is certainly not enough,” Kim Mi-kyung, a campaigner at Green Peace, told the Korea Herald. “Authorities should invest more time and money in figuring out the safest way to operate or build more radioactive waste management facilities if necessary, since the follow-up management of nuclear power plants is more important,” Kim stressed. She called for the establishment of an independent green energy committee in charge of thorough research and development of eco-power. “What is urgent for now is not to stop constructing new reactors, but rather to completely suspend the operation of the No. 1 to 4 reactors,” the Korean Federation of Environmental Movement said in a statement. 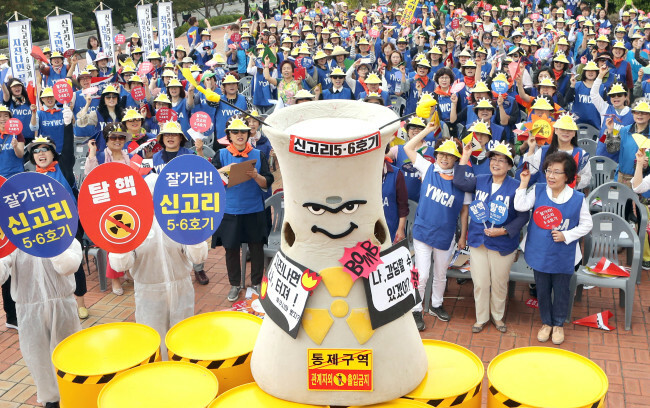 Urging the Moon administration to make good on the president’s election pledges, members of the KFEM demanded the president provide a clear roadmap for the future of the nuclear industry before June 18, when the Kori 1 reactor will be permanently suspended. Kori No. 1, the country’s first nuclear reactor, began operating in 1978 and completed its designed life in 2007. But its operation was extended to generate more electricity, pushing for electricity production of 40 years. 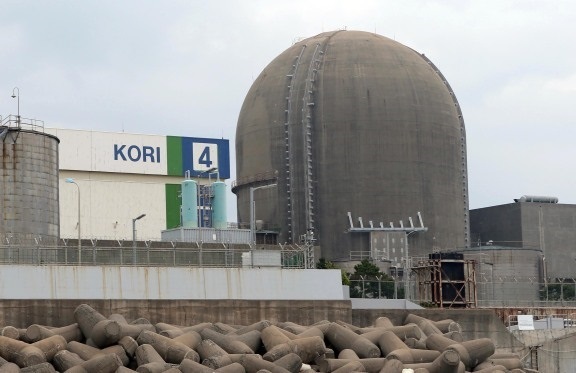 Environmental groups and local residents expect the Wolsung No.1 reactor in Gyeongju, North Gyeongsang Province, to shut down as well, as they won a court injunction on the government’s approval for the extended operation of another 10 years of the reactor that had already completed its 30-year run in 2012. The reactor, still in operation as of June 8, has been at the center of safety concerns over old nuclear plants due to a series of breakdowns caused by power outages. “Taiwan even stopped a nuclear reactor with 98 percent of its construction completed. Taiwanese lawmakers decided to become a nuclear-zero country by 2025. The process for Taiwan was certainly not easy, as the country continuously went back and forth from operation and suspension of the nuclear power plants,” said Yang Yi-wonyoung, head of the KFEM.